If we solve the puzzle, can we send it in to The Daily Telegraph to see whether we've won the prize? 9-Across (Gurkha knife) = KUKRI ? 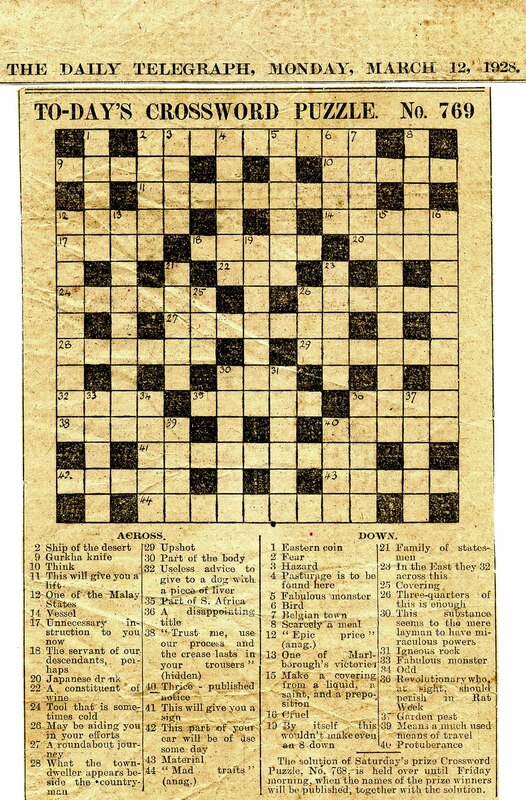 40-Across (Thrice-published notice) = BANNS ? I love that the puzzle appears to be hand-drawn rather than typeset. I've never done a British crossword before. How do the "(anag.)" clues work? Is the correct response an anagram of the clue itself? Is 44-Across DRAMATIST? If so, then 40-Down in not BUMP after all. Sorry for absence, just back from a quick city break. I'd love to send this off to the Daily Telegraph and just pretend the post had been a little slow. Yes, anonymous, the anagram clues will provide the answer from rearranging the letters. This is as far as I've gotten. I'd be more than happy to see a more correct solution to at least one spot where I have a feeling I'm "way off." Blimey dpv, very impressive response, thanks for being so thorough. Anyone got any contacts at the Telegraph? !